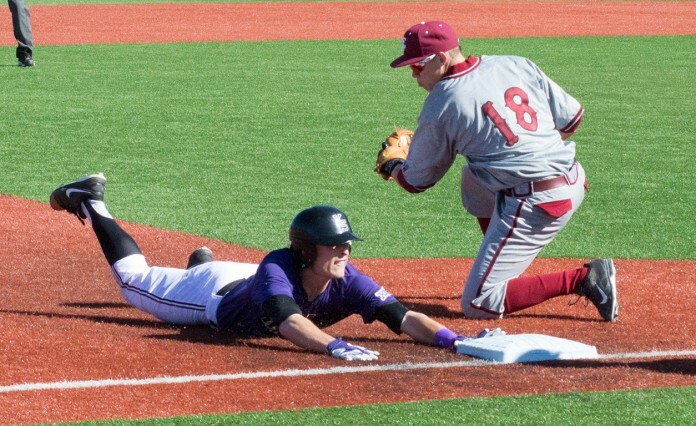 After a six-game road trip in which K-State baseball went 3-3, the Wildcats return home for a unusual late-season, nonconference series against the Arkansas State Red Wolves beginning tonight at Tointon Family Stadium. The Wildcats (21-23) are coming off of a bizarre journey from Waco, Texas to Minneapolis, Minnesota in which a flight from Dallas to Manhattan ended up being canceled due to weather. The cancellation forced the team to travel by bus all the way to Kansas City, Missouri to catch a flight to Minnesota several hours later. The Wildcats would end up dropping the first game of the series with the Golden Gophers in a shutout before blanking Minnesota 9-0 Wednesday. The Red Wolves (18-24), meanwhile, are fresh off a 8-3 midweek home loss to Memphis and a weekend series win over Appalachian State. Junior infielder Tyler Wolfe has been a force for K-State of late with six hits and two walks in his last four games. Wolfe is also carrying a nine-game on-base streak, a team and career high. If Wolfe can get on base in Friday’s game, he will be the seventh Wildcat this season to have at least a 10-game on-base streak. K-State will send sophomore Colton Kalmus (1-3, 3.99 ERA) to mound first to take on Arkansas State right hander David Owen (3-4, 2.28 ERA). Saturday will see sophomore Nate Griep (3-2, 2.60 ERA) facing right-hander Adam Grantham (1-2, 2.48 ERA). Ward has been dominant as a relief guy, putting up a 1.54 ERA in his last 15 appearances. Most recently, Ward threw a career-high 6 1/3 innings in relief in K-State’s 6-3 come-from-behind win to clinch the series against Baylor. With a sweep against Arkansas State, the Wildcats have a chance to move above .500 for the first time since Big 12 play began. First pitch between the Wildcats and the Red Wolves is scheduled for tonight at 6:30 p.m. at Tointon Family Stadium.